Remember last week when I said nowadays I take my whiskey in the form of marmalade… or cupcakes? Heh. Did you know then what was coming with this post? Anyway, I decided before the Halloween treats get into full swing, I’d do a little something different. Those of you who are Facebook fans of CR saw a preview of these the other day, but sadly the way Facebook compresses photos, even when they say they’re “hi-res” leaves a lot to be desired. Hopefully these photos look a bit better… if not, at least there’s some semi-interesting storytelling coming your way. 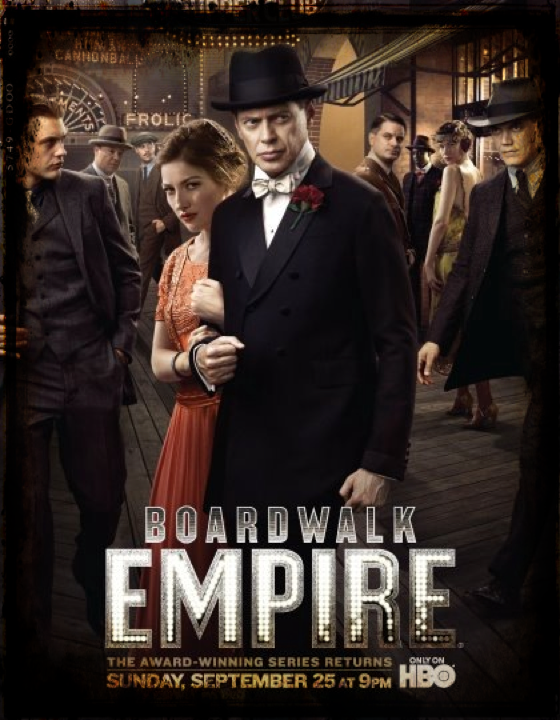 One of my absolute most beloved shows on television is Boardwalk Empire. Thank you, HBO, for having some of the best shows on television, ALWAYS. It just so happens that not only am I a big Steve Buscemi fan (Valley Stream represent! Okay so I’m not from Valley Stream, but I’m close enough), but that time in history, particularly in American history, is one of my favorites. I always say I was born 81 years too late; I should’ve been born in 1900 and been a suffragette & a flapper in the roaring ’20’s. Yes, it’s highly romanticized, and in reality it wasn’t a very easy time to be alive, but still. I’m an old soul & I think I was definitely meant to be around then… or perhaps I was, in another life. In that same vein, a new documentary by Ken Burns premiered on Sunday, called Prohibition, and it too is fantastic. My great-grandfather Tom Rooney was a rum-runner during Prohibition, starting when my grandmother & her brother were babies (my grandmother was born in 1918, her brother 1919). As Prohibition wore on, it got a bit more dangerous & by the mid-to-late 1920’s he had quite a few children & it wasn’t much worth the risk any more. 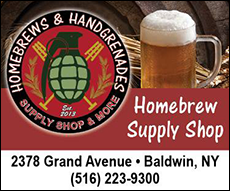 On the other side, as a child my grandfather used to go & get/bring home the disguised beer in an aluminum can (called “rushing the duck”) in exchange for some bakery buns (you can see where I get my priorities from) or a quarter from his uncle. Not to mention the fact that my aforementioned great-grandfather owned a bar. We’re a big liquor lovin’ family. On those sides alone, we’re Irish, German, Prussian, Austrian, etc… so what else do you expect? Not to give in to a stereotype or anything but I mean, last week I posted lemon-orange whiskey marmalade. 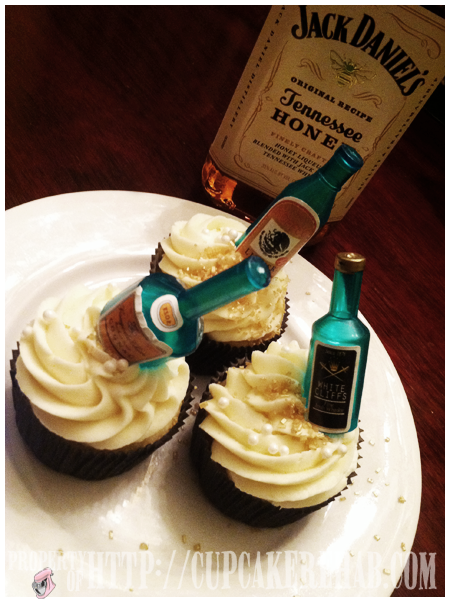 This week it’s whiskey cupcakes. Forget about the many reasons why, it’s clear I might as well have a Tommy gun under my arm, a cigarette hanging from my mouth & a stolen case full of Pimm’s next to my bathtub full of homemade gin. Obviously, the inspiration from these cupcakes came from both HBO’s Boardwalk Empire as well as the Ken Burns’ documentary Prohibition, not to mention some old photos of my grandparents, and first & foremost Jay. 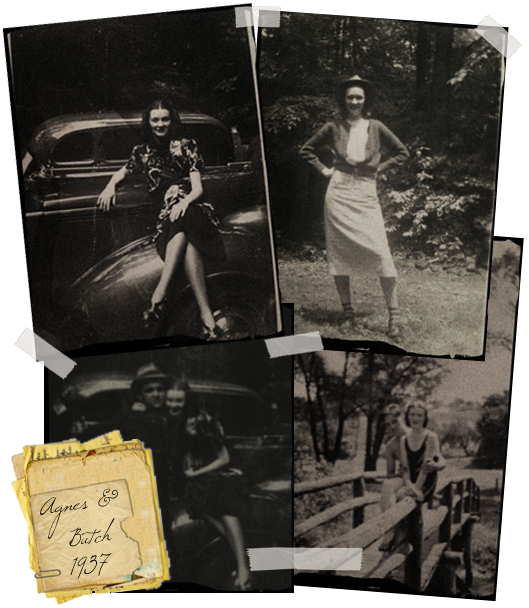 The photos of my grandparents, while from 1937, aren’t from the exact same era, but they’re so ‘Bonnie & Clyde‘ looking that they just reminded me of Prohibition… & guns & liquor, too, haha. Not that there’s any of that in the pictures! How awesome are those photos? I love them. I have two photos of both my great-grandmothers that actually are from 1919/1920, one can be found at this post, but somehow the feel of the above pictures seem to capture the essence & style I was looking for better. As far as Jay’s part in all this, he was really the main catalyst. A while back, he was out with his friends at a bar & tasted something new: Jack Daniel’s Tennessee Honey. He immediately thought of me baking with it, and bought some. How cute is he? Very. So I was thinking of what I’d make with it, perhaps a rum cake, except without the rum but with the JD… and maybe a honey glaze? Then I tasted it. Okay, well, I’m not a whiskey connoisseur nor am I a fan of Jack Daniel’s. I much prefer the sweeter, smoother taste of Jameson (and preferably in coffee if anything), so this new blend of Jack with honey liqueur was not really that different to me than regular Jack. Sure, I got the honey smell, however I tasted good ol’ Jack more than the honey. But I could tell that when added to some sugar, it’d be really delicious. So I decided to just go with cupcakes! I didn’t get the idea for the theme until the season 2 premiere of Boardwalk Empire, and of course the first night of Prohibition. 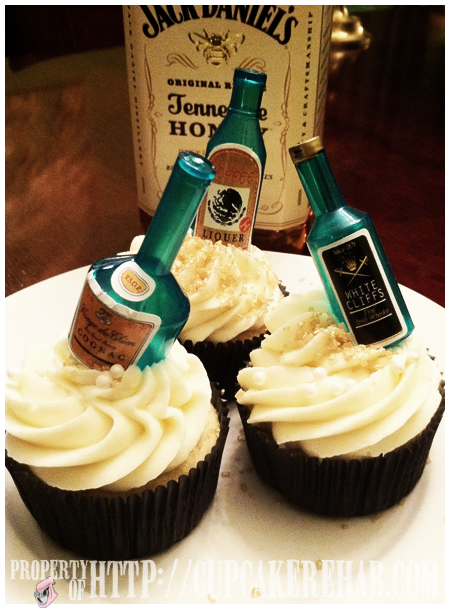 What a better way to enjoy these TV shows than with some cupcakes filled with whiskey!? And boy, did I ever make cupcakes. I made honey whiskey cupcakes with some delicious Jack Daniels Tennessee Honey whiskey in both the cake & the frosting, topping them off with sugar pearls, gold chunky crystal sugar & teeny little liquor bottles (courtesy of Primp My Cupcake at Etsy) on them… frosted with a jumbo closed star tip from The Cupcake Social, black liners are from Wilton. Keepin’ it classy! Aren’t they the cat’s pajamas? Preheat oven to 350° F and line a 12-cup muffin tin with liners. Sift together flour, baking soda, baking powder and sea salt; set aside. In a small bowl, mix yogurt/sour cream, vanilla, whiskey; set aside. In a mixing bowl, cream butter until fluffy. Add honey and sugar; mix well. Add eggs, one at a time. Add half of the reserved dry ingredients to the butter mixture; mix on low until just combined. With mixer running on low, slowly add the whiskey mixture. Add remaining dry ingredients until just combined. Fill cupcake liners ⅔ full and bake 18-22 minutes, or until a toothpick comes out clean. Allow to cool completely before frosting. In a small saucepan over medium heat, bring sugar and ⅓ cup water to a boil. Continue boiling until syrup reaches 238° degrees on a candy thermometer (soft-ball stage). Meanwhile, place egg whites in the bowl of a standing mixer fitted with the whisk attachment, and beat on low speed until foamy. Add cream of tartar, and beat on medium-high speed until stiff but not dry; do not overbeat. With mixer running, add syrup to whites in a stream, beating on high speed until no longer steaming, about 3 minutes. Add butter bit by bit, beating until spreadable, 3 to 5 minutes; beat in honey, then the whiskey. If icing curdles, keep beating until smooth. Don’t be alarmed if the frosting gets “slippery” in the bowl; that’s from the alcohol. It’ll pipe just fine. 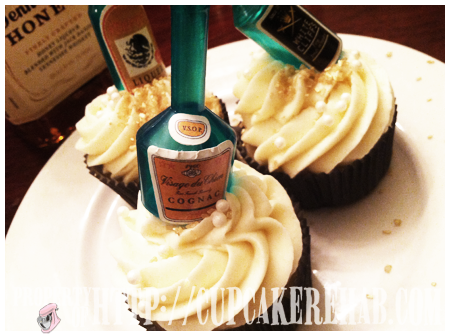 What a perfect way to sneak your alcohol- put it in a cupcake! As I was making these I came up with another amazing idea: make a whiskey custard, then fill honey cupcakes with it, and top them off with a whiskey/honey buttercream. I bet a whiskey custard would knock ’em dead. And they’d also be great for New Year’s cupcakes. Although I have to make a confession: I didn’t make the above buttercream. I just made a confectioner’s sugar buttercream and added some whiskey & honey (similar to this recipe). Only because it was late, I had eaten a big meal, I was tired, and the thought of the boiling sugar & the whipping of egg whites into meringue made me want to crawl into bed. Either way, they’re amazeballs. Whiskey makes a great frosting! Another confession? I’d much prefer this frosting on a plain vanilla cake as opposed to the modified honey-cake I used. It was good, don’t get me wrong. However I must say it felt a bit like overkill… I think it’d be better with just a cupcake made with pure vanilla topped with the whiskey-based frosting. I’m a bit boring like that. Like anything else, creating them/decorating them is only half the presentation. You have to dress the part. So I wore my brand new wingtip brogues. Nucky Thompson ain’t got nothin’ on me! 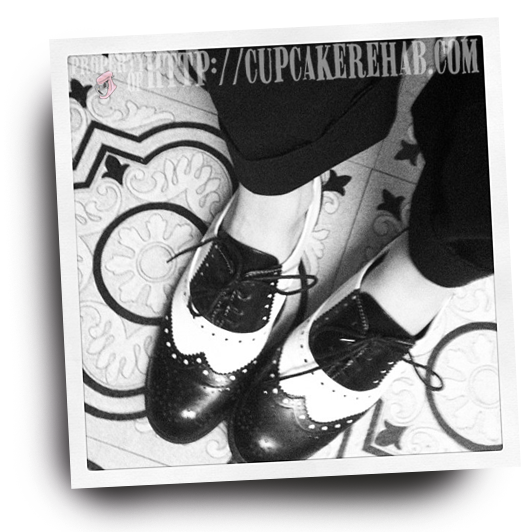 The consensus was that these cupcakes (and the shoes) were super cute & super good. Try ’em. Preferably while listening to Sophie Tucker. Whiskey is an extremely fall/winter-ish addition to any baked good or food (or drink). It’s warming by it’s very nature. So this recipe will work excellently all winter, substituting bourbon or scotch or any kind of good quality whiskey for the Jack Daniel’s I used; I’d just remove the honey, especially in the cupcakes (& in turn up the sugar content) unless you’re really looking for that particular flavor. Honey can be kinda obvious in some recipes, it’s not always subtle, so just keep that in mind. 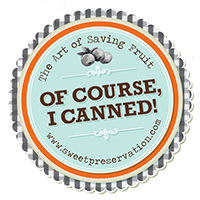 Happy No-More-Prohibition (even though it was actually repealed on December 5th, 1933, you can still celebrate now)! Next Post A monster mash-up of Halloween goodies! 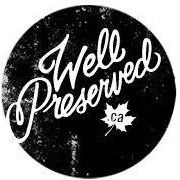 Im with you, I’m digging Prohibition PBS series too! (and Boardwalk Empire). These cuppycakes sound delish, I’m going to have to try these this weekend! They’re the best, aren’t they? I don’t know how anyone could NOT be interested in them! The cupcakes are awesome, but I’d halve the recipe for sure, and see if you like them. Like I said, I’d have preferred a plainer cupcake with the whiskey frosting, because it seemed like “too much” for me. But I’m quite boring… haha. Awesome! Can’t wait to make these. I wonder if amaretto would work, too? Hmm Aggie I don’t see why not! Just take out the honey! I am so happy I stumbled upon your site. 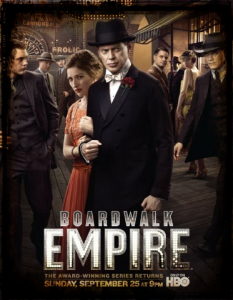 I am facinated with the 20’s and 30’s, Could hardly wait for the 2nd season of Boardwalk Empire and was glued to PBS for their Prohibition series. I have my grocery list in hand. I have to try yur cupcakes. Love the pics of your Grandmother. Thanks for the recipe! Oh duh. Sorry Brittany. Let me check over the recipe when I’m home & I’ll let you know. I hate when that happens!! Okay Brittany there shouldn’t be any milk in there at all. The liquid is the whiskey. That was an error in me writing it up, I’m so used to writing “add milk” haha. Sorry about that. I took it out. Awesome, I can’t wait to try them out they sound great. Thank you! will send this post to him. Pretty sure he’s going to have a good read. familiarity, thus it’s pleasant to read this webpage, and I used to pay a quick visit this web site everyday. You are so awesome! I do not suppose I’ve truly read through something like that before. and individually recommend to my friends. 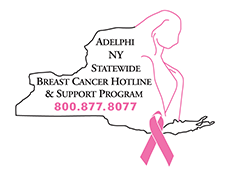 I’m confident they will be benefited from this site. I’m very pleased to uncover this page. I want to to thank you for your time for this wonderful read!! phase 🙂 I care for such info a lot. I used to be seeking this certain information for a very lengthy time. web page, because here every information is quality based data. a blog for? 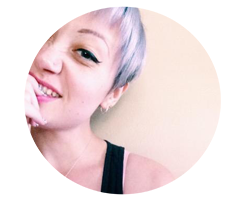 you make blogging look easy. 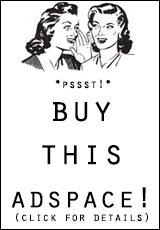 The full look of your site is magnificent, let alone the content!